The price will be 11.94USD/pcs with UK plug. The intellicharge i4 is a universal, automatic smart-charger compatible with almost all types of rechargeable batteries thus eliminating the need to own several chargers. The i4 is able to automatically identify Li-ion, Ni-MH and Ni-Cd rechargeable batteries and apply an appropriate charging mode (Constant Charge Current(CC), Constant Charge Voltage(CV) and Trickle Charge). Each of the i4's four microcomputer-controlled charing slots is capable of monitoring and charging batteries independently. Additionally, yellow and blue power/charging status indicator lights could visibly indcate battery status and charging process. i4: The all-new highly advacned smart charger. It's as simple as insert, detect and charge. * Certified by both RoHS and CE. Ni-MH/Ni-CD Battery: AA, AAA, A, SC, C Batteries. 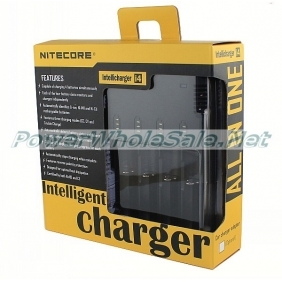 Tell us what you think about Nitecore i4 charger Sysmax I4 V2 Intellicharge Battery Charger (US/EU/UK plug), share your opinion with other people. 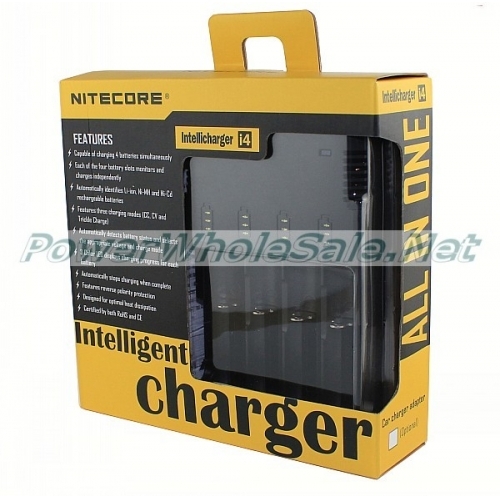 Please make sure that your review focus on Nitecore i4 charger Sysmax I4 V2 Intellicharge Battery Charger (US/EU/UK plug). All the reviews are moderated and will be reviewed within two business days. Inappropriate reviews will not be posted.